This low-fat supper is quick to make and is packed with flavour. If you prefer, replace the salmon with trout or sea bass fillets. 1 To make the salsa, scoop out and discard the tomato seeds and dice the flesh. Place in a bowl with the red onion, coriander, chilli (if using) and 1 tbsp each of the lime juice and olive oil. Season to taste with salt and freshly ground black pepper and set aside. 2 Heat a large non-stick frying pan over a medium heat and add the remaining olive oil. Place the salmon fillets in the pan, skin-side down, and cook for 5-6 minutes. Turn each fillet over, sprinkle over the rest of the lime juice and cook for a further 5-6 minutes or until the fish flakes easily. 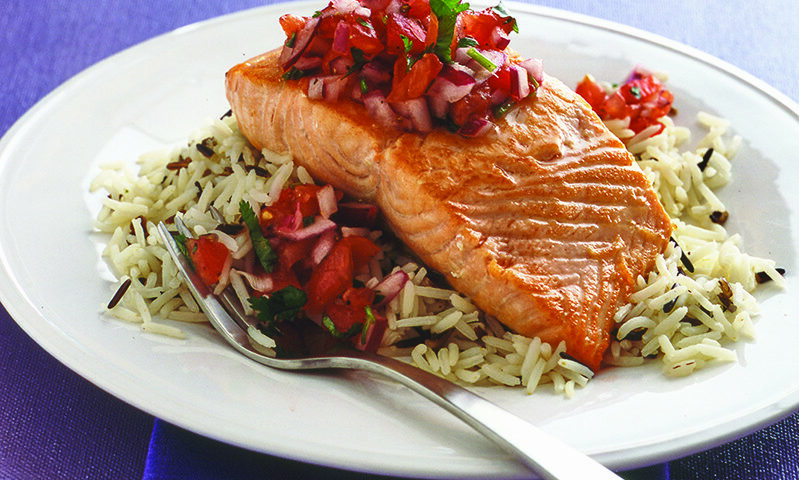 3 Serve the salmon fillets on a bed of boiled long-grain and wild rice and topped with the salsa. If you prefer to oven bake the salmon fillets, wrap in individual foil parcels and place on a baking tray. Bake in a preheated oven at 190C / fan 170C / gas mark 5 for 25 minutes.